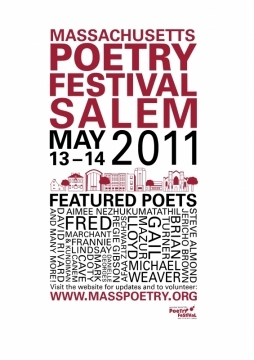 The poetry will be flying in Salem, Massachusetts, May 12, 13, and 14 at the 2011 Massachusetts Poetry Festival. Sadly, Pokey will probably not be attending as her girl turns 13 Friday the 13th and she will be all about that celebration. But I did go last time, and loved the homegrown, democratic feel, the great assortment of poets and poetry, and the fabulous small press fair. You can see the full festival schedule here, and a clip of featured poet (and my former teacher!) Mark Doty. You should go! You will hear everything from hip-hop to haiku, New Formalism to the new poets on the block. Celebrate Elizabeth Bishop’s 100th birthday with a talk by Bishop scholar and editor, Lloyd Schwartz. Enjoy a coffee and share conversation with book lovers at a reading of poets connected to the Boston Review. Attend a reading, to be held in the Japanese Art Gallery of the beautiful Peabody Essex Museum, by members of Boston’s Haiku Society. Participate in a workshop at the historic House of the Seven Gables. You can even travel to the festival on Saturday by riding one of our MTA sponsored Poetry Trains, departing North Station at 10:15 a.m., 12:15 p.m. and 2:15 p.m., with area poets reading on board. The 2011 Massachusetts Poetry Festival is hosted by MassPoetry, a non-profit founded to support the Massachusetts poetry community. OK, Pokey did her civic duty, and now she’s getting ready for important birthdays, Mother’s Day and Pokey’s one-year anniversary—stay tuned for details! Oh, and don’t forget, April 30 is the last day to enter the Big Poetry Giveaway and win free books!